The countdown to Crimbo has officially begun. It’s fair to say the festive season brings with it glitz, sparkle and glamour, so in terms of style it’s a chance to go all out and shine! With so many fashion details up for grabs, it can be a challenge to pull them together to comprise an effortlessly stylish capsule that will work for those all-important festive occasions. Here are 16 of my favourite key items that will ensure you stand out for all the right reasons. A ‘go to’ pair of black trousers is a key staple for anyone’s wardrobe and if you buy the right ones they can be versatile for work, rest and play. These trousers from French Connection are not only fuss-free with the flat front and high waist but the lustrous satin trim running along the outside of the leg is super flattering. 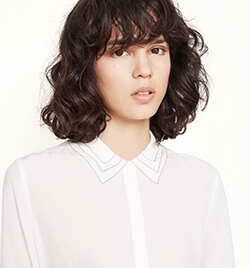 Layering is key this season and this pleat trim collar layering shirt from ME+EM is easy to wear and has an air of elegance to carry off that everyday chic look. Wear this top on it’s own, underneath a gorgeous cashmere knit or a sparkly blazer and skinny jeans for a smart casual festive outfit. 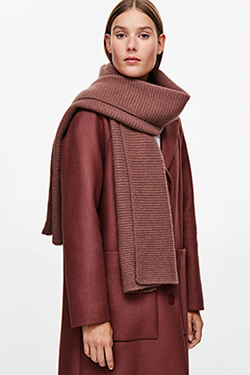 Invest in a gorgeous cashmere scarf this season, as it will give your outfits that luxe appeal and keep you super warm, day in day out, for the entire winter ahead. My fave cover up is this style from Cos.
A metallic pleated skirt is somewhat a statement but perfect for the party season to see you shimmer and shine! Easily dressed up or down, this skirt can be worn with pointy flats or heeled ankle boots. 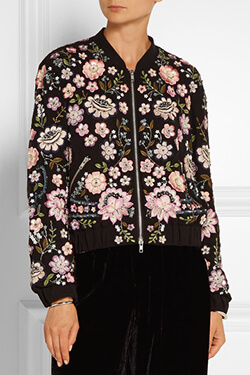 Jackets are a great way to add interest this season and this embroidered bomber jacket is no exception. Be bold and team with the metallic pleated skirt or play down with skinny jeans and a simple white t-shirt. Introduce some velvet to your winter wardrobe for personality, as it doesn’t have to look overly formal. 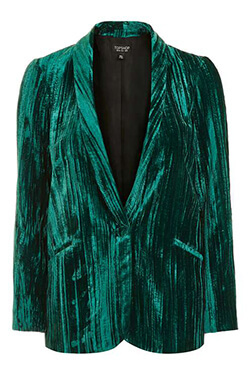 This jewel green crinkle velvet blazer is a stand out hero piece but keep your bottom half toned down for an understated weekend look. 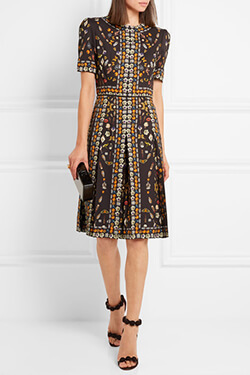 This Alexander McQueen printed dress accentuates the female form by adding shape with the strong shoulders, high waistband and A-line skirt. It’s a classic style that you can reinvent again and again. A great boardroom to bar little number! I love a silk shirt and this one adds a touch of femininity with the triple collar. Look for collar details so that when used for layering it adds interest underneath cosy sweaters and jumpsuits. This jumpsuit is incredibly versatile and the wrap style will suit most body shapes. Why not have a change from the usual ‘Little Black Dress’ and go for the ‘Little Black Jumpsuit’? A great style to wear for work with a shirt or polo neck layered underneath for warmth as well as a fabulous outfit ready for you to do business. Evening shoes don’t always have to be stiletto height and hurt like mad. 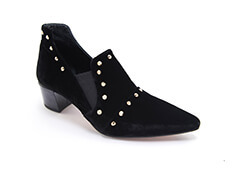 These velvet studded shoes from Cecilia Quinn have a modest heel and look every bit glam, perfect for a Xmas drinks party! Christmas jumpers don’t always have to feature reindeers or snowmen. 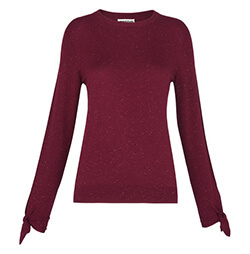 This sparkly knit from Whistles is a chic grown up version that will add a little bit of dressed up sparkle to your wardrobe. Keep it simple and wear with the French Connection skinny trousers or go all out and combine with the metallic pleated skirt – the choice is yours! With so much glitz and sparkle around, there’s no need to go over the top with statement accessories – the aim isn’t to look like a Christmas tree… I like to keep things simple with the adornment of a stylish ear cuff. There are loads out there to suit your style – from edgy to feminine styles. 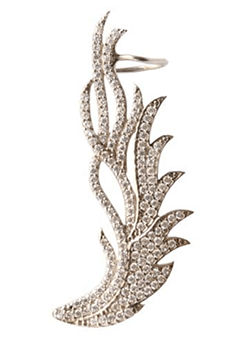 This silver ear cuff is eye-catching without detracting from your festive outfit. 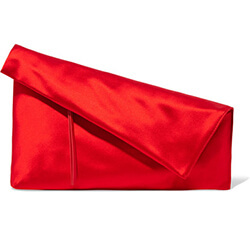 Add a touch of Crimbo cherry red to your party outfits with this gorgeous asymmetric fold-over clutch. Simple yet elegant – let it liven up your ‘Little Black Jumpsuit’! 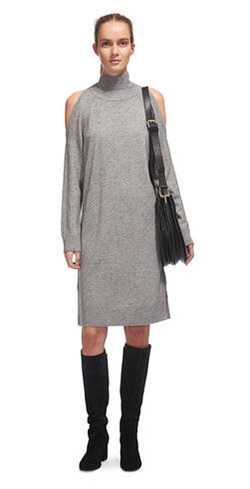 An exposed shoulder is a must-have style this season and this knitted dress is a great way to play down this look. Dress down with flat over the knee boots for an understated wintery everyday outfit or play up with those gorgeous black velvet studded shoes from Cecilia Quinn. A night out with the mum’s from school is the perfect excuse to dress in this smart casual knitted dress. 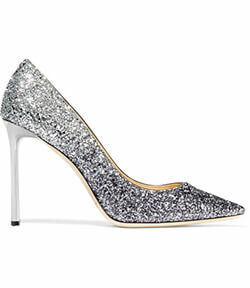 Dress up sophisticated all-black outfits with these stunning glittered pumps. Team with the Reiss wrap-front jumpsuit for an understated glam look. Keep things simple and don’t over accessorise. Complete this fabulous festive party look with the red satin DVF red satin clutch. 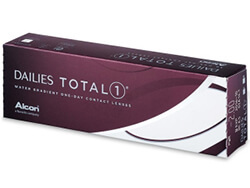 For glasses wearers it’s time to get your hands on these DAILIES TOTAL1® contact lenses. Perfect for reinventing your look for the festive season and a fantastic accessory for winning party outfits! 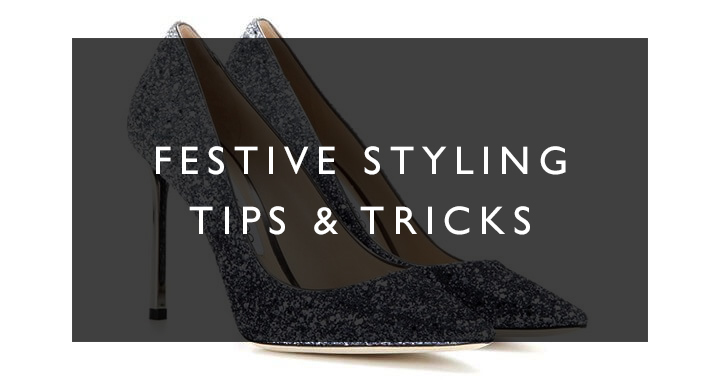 If you would like me to help you save time by creating some fabulously stylish festive and New Year outfits, I would be delighted to assist you. Please email me at chantelle@personal-stylist.co.uk to enquire about my personal styling and shopping packages. ← Bring It On … Our Fabulous Festive Outfits for the Main Events!